Malmesbury Boys aged 16-19 years of age wanted to send a positive message to local residents to dispel the perception that young people were hostile, with anti-social behaviour, using drugs and did not care about their estate. These negative views of young people by some local residents were seen in incidents which occurred from time to time on the Malmesbury estate effecting youths and adults. Several strategic projects were initiated with youths, local youth service providers and police to identify and address the issues affecting local residents. The ceramic mural project began after a serious of planned meetings and inter-generational work with senior citizens from Age Concern. The mural was to contain�positive messages for young people struggling to grow up on the estate in a inner city, and to provide future generations guidance, as well as inspiring hope in their environment. 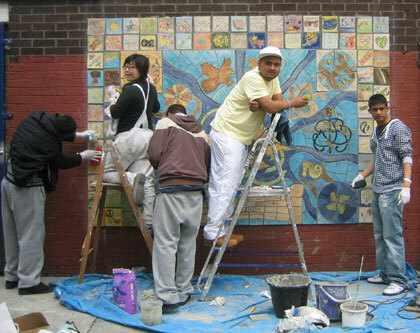 The ceramic mural project should also reflect the diverse community of Malmesbury estate; young people researched into signs and symbols on health and peace from many different cultures. The four elements of earth, water, air and fire, an ancient Indian proverb, with quotes by famous people (civil rights leaders, philosophers, writers) who contributed positively to peace and equality of humankind became the main imagery. 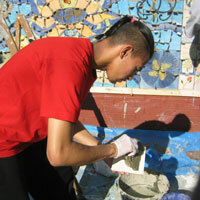 The borders reflect the young people who worked on the mural: their social and recreational interests were designed into tiled pictures, personal tags, trees, birds animals and other self-expressions. The Chinese symbol of ying and yang represents balance; the middle picture theme represents the lotus� and is a symbol in Bangladesh meaning rebirth. The middle of the lotus flower is a picture of the world; the ankh represents the ancient African Egyptian symbol key of life; looped around ying and yang lotus flower is the Celtic symbol of the rose with rivers flowing out. In the middle of the rivers are quotes from famous civil right leaders and poets. In between the river from right to left clock wise; the eagle ancient Indian symbol of freedom; with Celtic rose signs of (right and left) peace. Below the right rose is the ancient African symbol of Imhetop; (the winged snake wrapped around the sword) the worlds first multi genius; renowned in the ancient world as the god of medicine. Below this symbol is the sea horse. Left is the tree, a natural symbol of growth; top and bottom corners represents the elements of earth, air, water and fire. 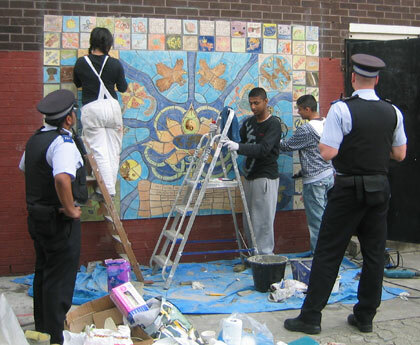 Young people from various cultural backgrounds were engaged in developing the ceramic mural with the core group of Bengali young men; the project started in February 2006; the duration of time spent on the project being completed enabled young people, youth workers and tutors to raised funding from the following key funders; Lottery-Awards for All, Metropolitan Police, Bow South Housing Office, LBTH-Youth Service. Tutors from LBTH-Arts education project and artists from Artyface Community Art group provided artistic tutorial support, facilitation and funding in kind. 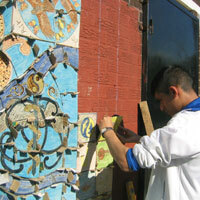 The ceramic mural materialised with the continual support from young people youth workers, artists and all of our funders.